The New York Fire Patrol had firehouses, drove fire trucks, fought fires and its firefighters wore uniforms essentially indistinguishable from the FDNY. But it was not part of the New York City Fire Department. In 1803 a group of volunteers formed the Mutual Assistance and Bag Corporation, the purpose of which was to protect and salvage the contents of structures from fire and water damage. Thirty-six years later the New York Board of Fire Underwriters was established. The group added fire fighting to its methods of preventing losses to insured property. Funded by the insurance companies, the Fire Patrol was established. In 1906 Franklin Baylis began work on a new house for Fire Patrol #2 which was operating from 31 Great Jones Street in Greenwich Village. The old boarding house at No. 84 West 3rd Street was razed and in its place rose a handsome four-story structure with Beaux Arts splashes. Constructed of red brick, the architect made restrained use of limestone and terra cotta to embellish the façade. Stepped limestone over the openings of the street level rested on rusticated brick piers. Above the truck entrance a carved head of Mercury represented the speed of the responders inside. 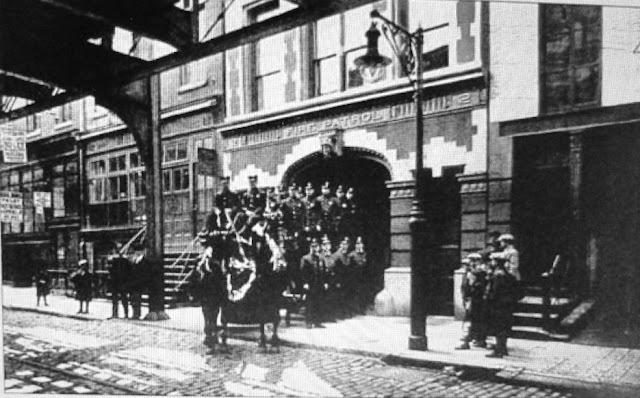 The Fire Patrol poses outside its new house, below the Third Street elevated train tracks. 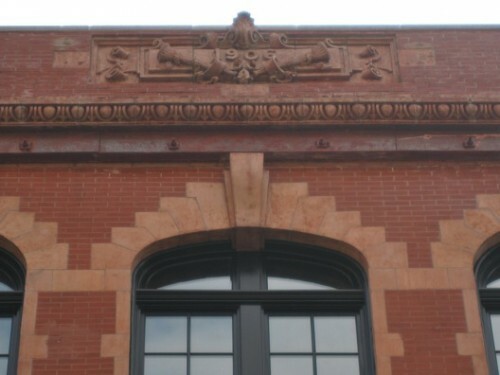 Limestone quoins framed the windows and piers and above the cornice a terra cotta panel announced the construction date of 1906 above firemen’s trumpets. The fire patrol company moved into its new space in 1907. A tool used by the Patrols to minimize water damage were heavy tarpaulins measuring around 12 by 18 feet. Used both as "stock covers" (to protect goods from fire hose water) and roof covers, they were rapidly spread at the scene of fires. In the new Fire Patrol 2 long, numbered poles extended through the beams of the top floor for drying the canvas tarps. The firefighters then “turned on a full flow of water from a 2-1/2 inch hose. Hundreds of gallons of water poured in and roared down into Mr. Bugher’s office.” Mr. Bugher was the Deputy Police Commissioner. Below Bugher’s office was the “telegraph room,” and dispatch room filled with telephone equipment. “It was then found that the water was putting the entire police telephone system out of business,” said The Sun. Fire Patrol 2 was “hurriedly sent for” and the heavy tarpaulins were stretched across the ceiling of the telegraph room to catch the water. The work of the fire patrolmen was of extreme value to the insurance companies; but it was highly dangerous work, sometimes resulting in fatal injuries. The New York Tribune reported on April 23, 1920 that the New York Board of Fire Underwriters had decided to increase the patrolmen’s pay. With the raise, patrolmen first grade would receive $1,900 a year; sergeants $2,100 and captains $3,200. Among the Fire Patrolmen responding on the tragic morning of September 11, 2001 was Keith M. Roma. Roma worked for over an hour evacuating World Trade Center employees. Witnesses estimate that he personally removed more than 200 individuals. He suddenly was missing. On Christmas Eve 2001 Keith Roma’s body, his helmet at his side, was discovered near the bodies of nine civilians he was trying to save. He was the first fire patrolman to die in the line of duty in more than three decades. The Fire Patrol 2 building by now had seen the effects of misplaced fire fighter love. The limestone sculpture of Mercury had been painted in flesh-colored paint with bright yellow hair. The limestone at street level was painted white and the entire building above was covered in shiny red enamel; the firefighters’ favorite hue. Then in 2006 the Fire Patrol was disbanded. 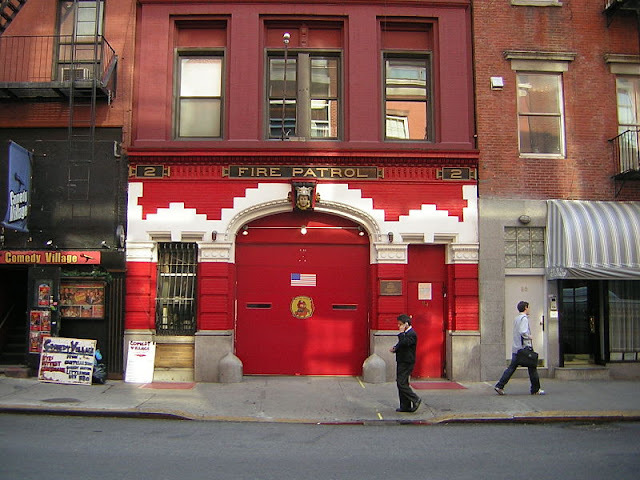 The last three Fire Patrol houses were abandoned and Fire Patrol 2 was offered for sale by the New York Board of Fire Underwriters. The Greenwich Village Historic Society panicked, quickly requesting the Landmarks Preservation Commission to landmark the structure. The Society need not have been alarmed. Journalist Anderson Cooper purchased the 8,240 square foot building in 2010 for $4.3 million and began restoration. Cooper commissioned architect Cary Tamarkin to renovate the fire patrol house into a private residence. “We could not be happier with the gorgeous exterior renovation that highlights and respects the unique history of the building,” the Society said in its blog on September 1, 2011. 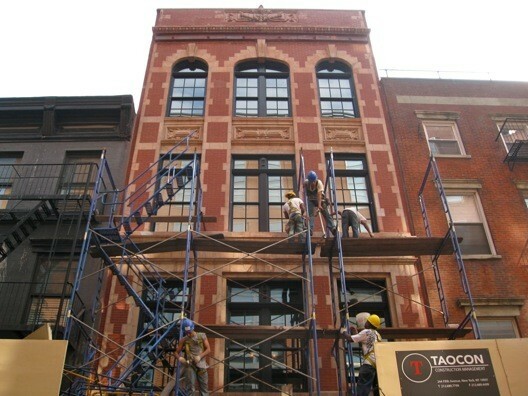 Tamarkin restored the stone and terra cotta detailing, removed the layers of paint and replaced the windows. The architect promised to retain much of the interior details like the herringbone brick floor, brass fire poles and cast iron spiral staircase. Four bronze plaques dedicated to the patrolmen lost in the line of duty had been removed from the façade; but Cooper planned to reinstall them in their rightful places. The handsome utilitarian building has come back to life, its outward appearance looking much as it did in 1906—without the overhead train down the middle of West Third Street. It is a praiseworthy example of the reuse of vintage structures.